How do I cheer my students on? 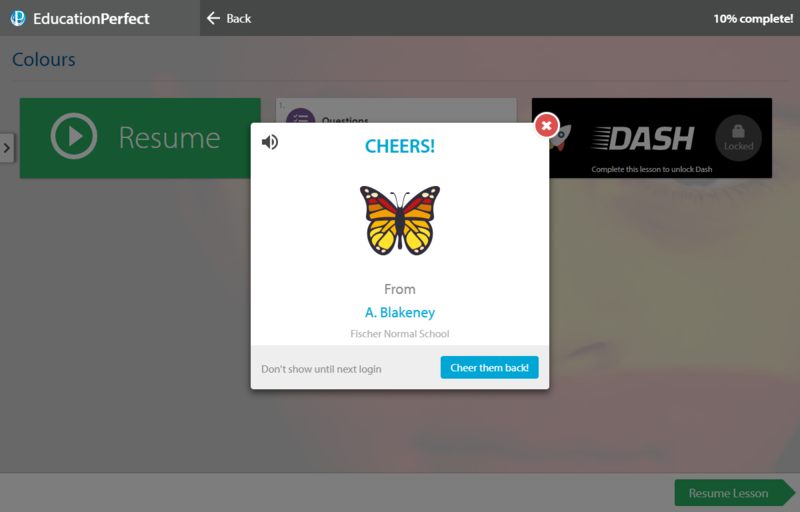 You can send a "cheer" to students, which shows up on their screen when they finish a test. This can help to acknowledge and motivate hard working students. Click on Cheer your students under the 'Other areas...' header on the left side of your Control Panel. This will show you a list of students who are online. You are able to either cheer individual students on by clicking on the horn icon beside their names, or you can collectively cheer on all students currently logged in by clicking on Message All Students! at the bottom of the page. Cheers can only be received by students who are online and will appear to students when they complete a test. Students can cheer each other on as well; if you want to stop this during class you can disable cheers during a homework task. For students who are browsing, their cheers will not appear as a pop-up but will show up in the Achievements section on the sidebar of their student zone or when they enter a new activity. The comet, dolphin, rainbow, and unicorn stickers are rewards for reaching certain levels. They cost a significant number of points for students to send and teachers are awarded them for increasing their certification level. What is the Education Perfect Teacher Certification?